My second FLCL wallpaper, Memories in Time. Please download since the thumbnail makes it look worse then it actually is. I don't know why but the idea for this wallpaper just popped into my head the other day while watching... Fullmetal Alchemist. Go figure. 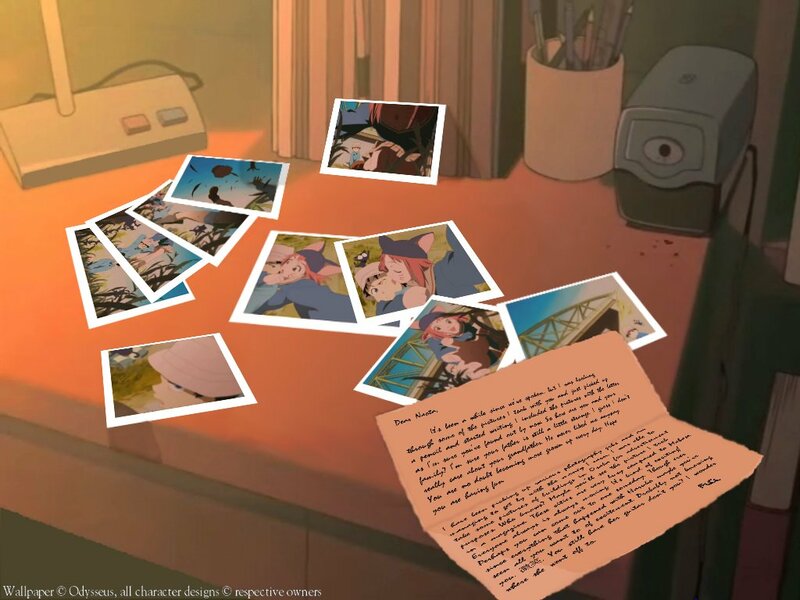 ^_^' Basically it's a bunch of pictures Mamimi took spread out over Naota's desk. As well as a letter from Mamimi (since I put this after the end of the series. Of course the notion that Mamimi eventually contacted Naota agian was kind of just made up while I was making this wall and there you go.) It took a while to find the right color to adjust everything to to fit with the lighting but once I found that it went well. I had some trouble with shadows but I think it turned out alright. Though the letter edges are rougher then I would like. And certain parts of the background are a tad fuzzy. But I'm pleased with it. Browse FLCL Gallery: Recent | Popular. thats so cool, it all looks so perfect! lol Mamimi takes some pretty crappy pictures doesnt she? loli think i found the symbol...is it on top of the pencil sharpener? well this is a really awesome wallpaper, great job!!! Wow odesseus that is cool. 0_0 The idea of it is really good. You're very creative ^_^. You could try to adjust the brightness/contrast of the photos to make it blend it (or maybe it's just my computer monitor). Other than that, it's a wonderful FLCL wallpaper. Nice job! I think the colour is not bright enough. But I like the design of this wallpaer. You hava a gift for making wallpaers. and apparently i can't post this unless it is 64 characters long..wow.that's really specific.great..this could have just been a simple question so now i have to type all this random crap until it's 64 characters long...grr.oh well. Your works always impress me! Good job!? ?